"Surf right in front of the house!" Welcome to Casa De Madera (The Wooden House) your perfect beachfront surf retreat! You will love staying at this rustic beach house, full of character and charm. Relax in the natural surroundings and let the soothing sounds of the ocean put you to sleep each night. There's nothing like it! The value in Casa De Madera is in the location right on the beach, where you can surf and watch the sunsets everyday from the privacy of your own backyard. The expansive swimming pool is great for young kids as there's a large shallow section, and it is situated just steps from the beach! There are views of the ocean from almost every room in the house! You'll know when to grab your board and head for the water at any moment! With beds for up to 11 people, Casa de Madera is fully equipped to accommodate large groups so bring everyone! Downstairs hosts the living room and dining room which can all be opened up to let the tropical beach breeze blow through. The kitchen is there with lots of space to cook and serve up great dishes and the floor plan is perfect for entertaining. The first bedroom is here with an en suite bath and has a twin bed and a queen bed for sleeping up to 3 people. The kitchen is fully equipped with electric burners, electric skillet, rice cooker, microwave, coffee maker, and blender. The house is also well stocked with all the kitchenware you will need, to cook and serve your meals on the beach! Upstairs there are 3 more bedrooms and 2 baths. The master bedroom upstairs offers a quiet and quaint beach view balcony perfect for a romantic evening of watching the sunset, or sipping coffee while watching the waves early in the morning. The other two bedrooms share a spacious bathroom and can sleep 3 people to each room. There's also a lovely common area upstairs great for gathering to play cards, read a book or just hang out. At this rustic house you don't have to completely unplug from the world, the house has cable T.V., wireless high speed internet for your modern conveniences. The beachfront location gives it a nice tropical breeze and there are fans throughout the house for your climate control comfort. The house is very well maintained and clean. The price includes daily housekeeping and pool maintenance. The housekeeper and grounds keeper are a very nice couple from Nicaragua who live in the separate caretaker's house. The housekeeper can be hired to cook for your group if you like, making it an even more enjoyable vacation experience. There's no better way to enjoy Playa Grande than being right on the beach, where you don't have to rush to go see the sunset everyday because you're already at the beach! Playa Grande is an amazing beach with over 3 kilometers to explore and find waves, it never gets crowded! Within a 5 min walk of the house there's a local grocery store, and several restaurants to choose from, including a unique cave bar which has fun every Friday night with live music. 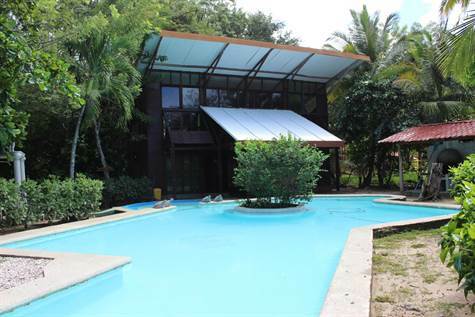 The house is located near the Tamarindo Estuary so if you feel like venturing there to do some shopping, banking or dinning out, it's an easy 10 min stroll down the beach and then a $1 boat ride across the river. The property managers live just 5 min up the road and are available for anything you may need during your stay at Casa de Madera. They can arrange the airport transportation, as well as surf lessons, surf board rentals, or any tours and excursions you may like to do. We look forward to hosting you at this special ecological style beach home!